An introduction to the study of programming languages that evolved from lecture notes used in a programming languages course for students at Johns Hopkins University. Click here to read the full license. 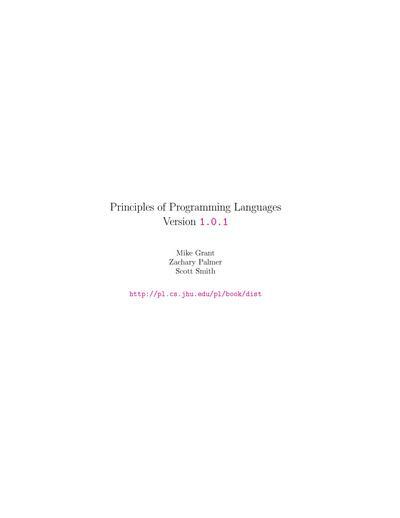 Scott F. Smith wrote:This book is an introduction to the study of programming languages. The material has evolved from lecture notes used in a programming languages course for juniors, seniors, and graduate students at Johns Hopkins University. The book treats programming language topics from a foundational. It is foundational in that it focuses on core concepts in language design such as functions, records, objects, and types and not directly on applied languages such as C, C++, or Java. We show how the particular core concepts are realized in these modern languages, and so the reader should emerge from this book with a stronger sense of how they are structured. While the book uses formal mathematical techniques such as operational semantics and type systems, it does not emphasize proofs of properties of these systems. We will sketch the intuitions of some properties but not do any detailed proofs. Zachary Palmer is a Ph.D. candidate in Computer Science at Johns Hopkins University, advised by Dr. Scott F. Smith. His life as a graduate student started following a carefully-planned and lucky escape from an industry job as a software engineer. He plans to continue pursuing his interests in typed scripting languages, compile-time metaprogramming, and teaching in his position as a visiting professor at Swarthmore College starting in the Fall semester. 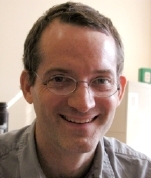 Dr. Scott Smith is a Professor in the Department of Computer Science at The Johns Hopkins University. His research interests span a number of areas in programming languages.